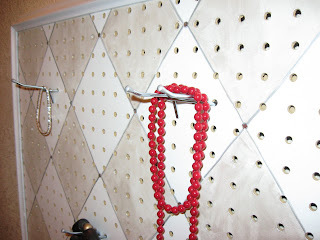 For Christmas, I made my mom this peg board for her jewelry. She has wanted one for a few years now. She was going to make it herself, but she is not too fond of the table saw. It was not too tough, just time consuming. I found a frame at the second hand store and painted it white. 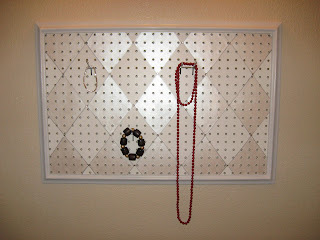 I cut the peg board so it would fit inside the frame and painted diamonds on it. I outlined the diamonds with silver paint. It worked out pretty good.